His highness Raja Rama varma - Sakthan Thampuran - was the architect of Thrissur pooram and the Kochi dynasty was the official sponsor. 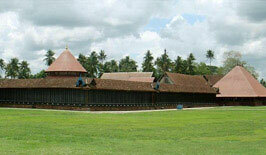 The summer palace of Kochi was the "Vadekkara Kovilakam" in Thrissur. It is now the protected monument under Archeological survey of India situated just opposite to present north privet bus stand. The members of the royal family used to stay here and pay their holy dersan ("Thrikan parkuka") at "Asokkeswaram" temple. These temples which is the oldest Siva temple in thrissur is wholly owned by the erstwhile Kochi kingdom and is adjacent to "Vadakkechira" .The presiding king have their own limitations and duties. Sakthan Thampuran requested all participating temples (some of them are 8K.M. away from Vadakumnathan) to assemble before "Asokeswaram" on two days before pooram with full setup. The Thampuran will scrutinize the set up and listen to any anomalies and set right then and there. After every thing were settled the kingdom representative will honor all pooram participants with Para in the presence of the king. 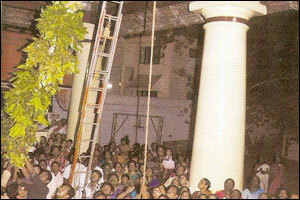 During this ritual "chadikottuka" will be performed (jumping while beating instrument like a mini "nakaram"). 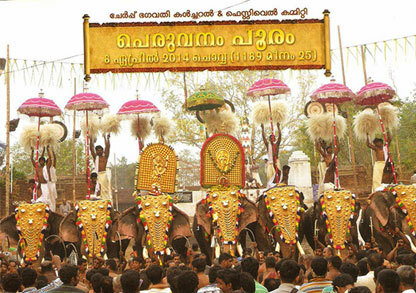 The show will end with a "mini pooram" as a token of respect to the king. Present Scenario: These rituals were continued for few years after the decline of the Kochi Dynasty and stopped due to the lack of leadership during late fifties. We suggest subject to tantric approval and so on so forth. All the ten participating temples should assemble in the asokeswaram temple at 2.30pm. on the "sample day". As in "Mahasivarathri" let the lord of asokeswaram - the official host - be the leader of the event. Let Paramekkavu and Thiruvambady be placed by both sides and other percipient on each side. Since "SASTHA" is the "yodha" let both ends be guarded by sasthas. This is the rare occasion where devotees can offer their offering as "Para" to 8 devies, 2 sasthas and Siva. Let panchavadhyam be the vadhyam and the procession should pass straight to Round. Enter the Thiruvambady Pandal conclude "panchavadhyam" start "Panchari". The melam can be concluded at "sreemoola sthanam" of Vadakumnathan at 7.30pm. and the sample fire works. This is only a blue print. It should be finalized in the joint meeting of all 10 participant poorams and Cochin devaswom board. Please note: Already thrissur pooram is famous for Panchavadhyam (Madathilvaravu of Thiruvambady), Pandy melam of Elinjithara (Paramekkavu). Let another important melam "Panchari" be performed in connection with Thrissur pooram. 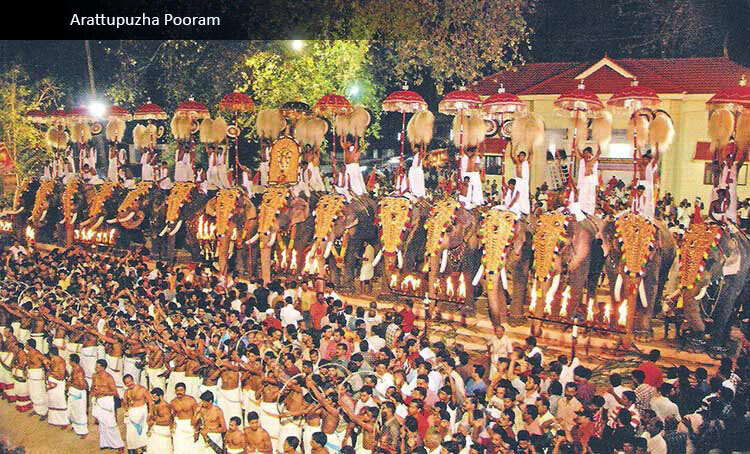 All participant poorams are ready for pooram. No Extra cost is involved. All ready adequate arrangements are made for "sample"
Fire works, no more additional arrangements are required. The Cochin Devaswom Board who represent the Kochi dynasty be the official sponsor with out much financial Commitment. 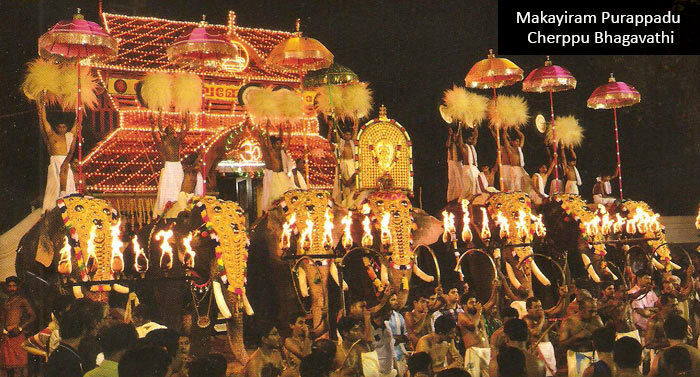 A pooram with 11 Elephants, Siva at center accompanied by 4 devies each on either side guarded by two "Sasthas" with "pancharimelam". Twilight at the right angle. Imagine the montage. Another magnificent view of the greatest show on earth "Thrissur Pooram". Peruvanm Pooram - 8 April 2014. The most prominent & dominant "Gramam"(Village) of erstwhile 32 "Kerala grammas" incorporated by Saint Parasurama, Peruvanam or Perumanam Gramam is having the rich heritage in performing temple arts. Situated at 10 kms southwards from "Vadakumnathan" on Thrissur - Thrippayar rout, the Peruvanam Mahadevar Temple is constructed in 6th century A.D. The main deity of the temple is "erattayappan" two "idols" in a single base. One more temple is there adjacent to this "Grabhagriham", the "Madathilappan" 10m high and 3 storied. 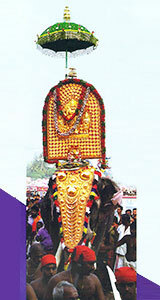 The idol of sivalinga is more than 2m high with a reasonable width. The upper storey walls of sreekovil is decorated with the sculpture of Brahma, Vishnu and Maheswara. The presiding temple of 42 desams(sub villages), the "Peruvanam pooram" of this temple is considered to be second oldest socio-religious festival in world still in practice. The 27 day long "devamela" starts with fixing the flag post at cherpu bagavathy temple and announcing that the 24 participants are ready for this year "Peruvanam-Arattupuzha" pooram. The melams at eastern path way of the temple is world famous for its perfection and ambience. The "panchari melam" is prominent among them. Most of the practicing vadhya kala artists of kerala are either from this gramam or closely related to "Peruvanam". Devi temples of: Cherpu, Oorakam, Thottippal,KadalasseryPisharical, Anthikadu, Edakunni, Ayyukunnu, Thaikkattussery, Kadu-ppassery, choorakode, Kodakara Poonilarkavu, Chalakudi kattu Pisharical. Sasta temples of: Chathakudam, chakkumkulangara, kodannoor, Nankulam, Sreemattil, Nettissery, Muppliyam Kallely, Chittichathakudam, Medamkulam. The tempo starts with the "Aswathy vela" on star aswathy at Cherpu bagavathy temple, followed by "karthika purappadu" in kadalassery pisharical, Kodakara, Thottippal "Rohinivilakku" of "oorakathamma thiruvadi" With the "Makiyeeram purappadu" at Arattupuzha, trippayar, oorakam, chathakudam, cherpu, anthikadu & choorakodu the festival is on the move. The tempo continues with "thiruvathira purappadu/thiruathira vilakku" at Muppliyam kallely, chathakudam & Arattupuzha. The next day "punartham vilakku" at thaikattussery, and chakkumkulam. On "pooyam" nakshatram (star) "Peruvanam Pooram(pooyam)"
Next day on ayilyam star "Pidicaparambhu pooram". 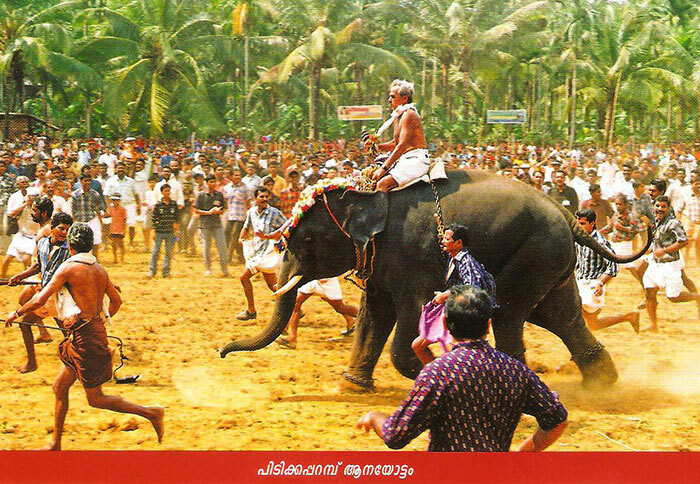 On the makam day morning anayottam(Elephant race) at "Pidicaparambhu" and in the evening "tharackal pooram" at arattupuzha. On pooram day evening the devamela starts and ends at next day with "arattu". All temples participating in this mela will have "kodickal pooram/uthram vilakku". The uthram day night arattupuzha sasta will perform gramabali covering more than 17temples important junctions, some special trees and ponds and end up giving Bali to "kshetrapala" (god of temple security) and Atham kodikuthu. Chathakudam sasta along with Thiruvulla kavu sasta will perform "Gramabali" covering the entire Gramam on uthram day. 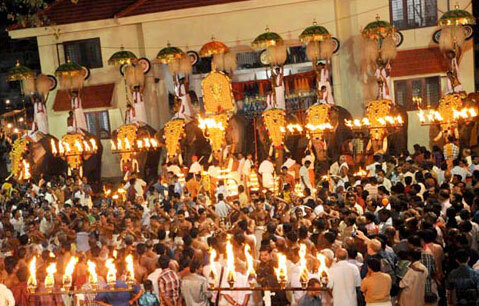 Chathakudam will conclude the pooram on next day known as "Atham kodikuthu". It is interesting to note that the gramabali is performed by both deities traveling on a single elephant. 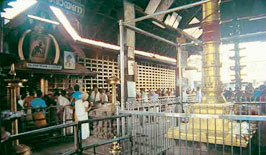 The brief description of the events: main venue of the pooyam is the eastern path way to Peruvanam temple. This is an inclined strip bounded by high compound walls. Few pooram will ascend while others will descend. The thrilling paces starts with "kadalassery pisharical bhagavathi" ascending with panchari by 4pm. By 6.30pm. "Arattupuzha sasta" will descend with "pandy". "Chathakudam sasta" will ascend with panchari at 7pm. and stops at mid way and latter joins with "oorakathamma" to continue panchari. Meanwhile the "Cherpu bhagavathi" will enter through west nada with "panchavadhyam". 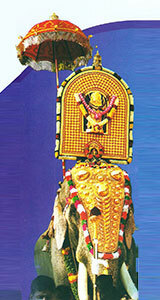 Later at midnight there is "Peruvanam vilakku" in side the temple premises with panchari. Again there is a "pandimelam" at west nada. Another interesting factor about both Peruvanam and arattupuzha pooram is "Thiruvulla kavu" sasta is participating for this "gramabali" only. An interesting tail piece: even though all these pooram enters and leaves the temple premises: "permanathappan" is a silent spectator to this event. 12. Midnight - Vilakku inside the compound by "Sastha dieties" - Panchari Melam. 12.30am Cherpu Bhagavathy reaches at west nada with Panchavadhyam. The majestic journey through his own land and the dramatic entry in the wee hours is really royal. 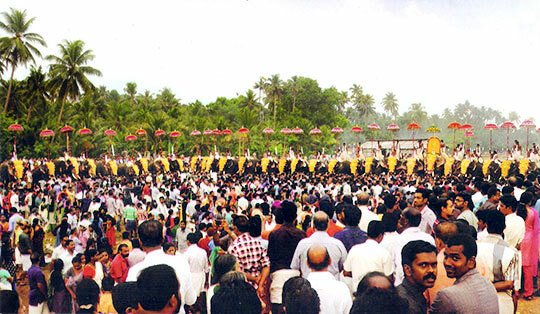 Thevar at center in a elevated "Nadavarambu" (foot path among paddy field) Cherpu bagavathy and oorakathamma thiruvady on both sides and others in either side facing the rising sun, is the panorama of this pooram. The view of these 70 odd caparisoned elephants, slowly marching towords the rising sun is an amazing view. It is believed that 33core devathas of Hindu mythology will be watching this greatest show on earth. It's the "Arattu" of famous "Peruvanam" pooram. 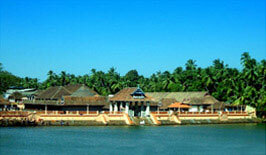 This is the base temple of 64 primary and other 100 and odd kali temples in Kerala. The construction of this temples date back Chera Dynasty. It is the temple built for the legendary "Kannaki" of "Chilapathikaram" during second century A.D. as per legend. The unique thantric style "Rurujithvithanam" is practiced here. This tantric branch is highly sophisticated and calls for skill, meditation and dedication of the "Thantri". Sree Sankara installed Sree Chakra here. The combination of 4 triangles (Siva chakras) and 5 inverted triangle (sakhti ckaras) is a mathematical puzzle which reveals secrets of the ultimate universe and modern science could not find its equation. The 12 feet stone vigraha of the Kshetrapaln (Roughly translated as temple chief Security officer) is the biggest in Kerala. 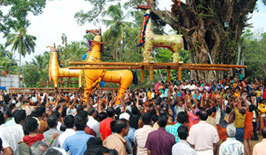 The Bharani festival is during March - April and the "Thalapoli" is during mid Jan to seven days. The "oracles" of 200 odd temple spread over kerala after travelling their respective "Thattakams" reaches to Kodungallur Temple during "Bharani". 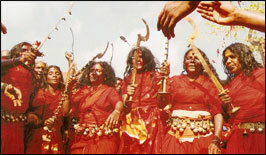 The oracles will enter the temple chanting "Obscene" songs and beating the temple roof with sticks. 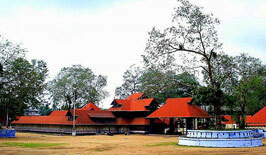 One of the 10 paradises in the world, Guruvayoor temple is located 29kms from Vadakumnathan. 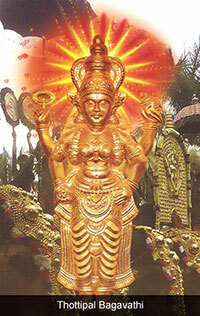 The idol of Guruvayoor temple is considered to be extremely sacred since it is carved out of "Pathalanjana Sila". The idol was once worshipped by lord Mahavishnu in Vaikunda and handed over to Bhrama. Later the idol was passed through the sacred hands of Sutaps, Kasypa, Vasudeva and finally to Lord Krishna, who installed it at Dwaraka. At the time of "swargaarohana" (his heavenly abode) Krishna requested "Udhava" to install this vigraha at a suitable place. Lord Siva pointed out the place adjacent to "Rudra theertha". The place was sacred since under the waters of this Rudrathreetha Lord Siva worshipped Mahavishnu and emerged out and revealed "Rudra geetham" a hymn praising the lord Mahavishnu "Brihaspathi" (the deva "guru") and "vayu" (the god of winds) installed the idol at this place and the place is called "Guruvayoor" (oor means place). At the time of installation Lord Siva along with Devi Parvathy was present. Siva moved further north due to lack of space and it is Mamiyoor Siva temple. Lord "Mahavishnu" gave darsan to Vasudeva in the jail as "Bal Vishnu" and thus the concept of baby boy Unnikrishnan the legend.The concept was popularized by Poet "Poothanam" through his famous stanza "who need another kid when Unnikrishnan is with in my heart?". Another poet "Melpathoor" and ardent devotee "Kurooramma" made this temple famous. Punnathoor Kotta- the elephant park some 3 Kms away from the temple where more than 65 elephants of Lord Guruvayoorappan is kept in natural ambience. Vrindavan Estate at vengad about 55 km from Guruvayoor at Malappuram (Dist) around 550 cows is looked after by the devaswom Guruvayoor Ekadasi & Chembai Sangeethotsava. ( Music Festival). The Ekadasi, falls during Nov/ Dec. months, is the day Lord Sree Krishna imparted Sreemat Bhavad Geetha to Arjuna at the battle field of Kurushetra. The 15 day long music festival , which last till the ekadasi night is in commemoration of Chembai Vaidyanatha Bhagather who was a doyen of Carnatic music . Bagavather was an ardent devotee of lord Guruvayoorappan and used to offer his music recital on the Ekadasi day till he left his heavenly abode. Nalambalam Yatra In the Malayalam month of Karkidakam (July 15th to August 15th) - the Ramayana Masa, thousands of devotees do this special pilgrimage, to 4 temples in a single stretch which is popularly known as Nalambalam thozal. It is believed that worship at all these four temples on the same day either in the morning session or evening session at a stretch is highly blissful. Some ardent devotees used complete this pilgrimage at "Arattupuzha temple(16km south of Vadakumnathan)" since the deity at arattupuzha is "Vasishta" the "Devaguru"
The idol of Sree Rama was installed at this temple by the side of the river "Thivra" (Thiru purayar) meaning sacred river. Lord Mahavishnu during his "Vamana incarnation" visited this place and found no water was available to wash his legs since the whole place was dry and desolate. Vamana took the water from his "kamandalu" (a small round vessel used to carry water by sanyasis) and poured the water to wash his legs. That source of water never went dry but kept on flowing as the Thiru Purayar or the Thriprayar (river of divine source) as it is called now. When "Naranathubhrandhan", the eccentric philosopher paid a visit to the temple, a riddle was brought to his attention, as usual. One stone in the "Balikallu" is always unstable. Brandhan corrected it after some typical poojas of his own style. That stone is still available in the temple premises. The one among 12 off springs of Saint Vararuchi ("Parayipetta panthirukulam" - the antecessors of Kerala) Narayanan was instrumental to systemize the rituals of this temple and installed mother Earth (Bhoomi Devi)and Sree Bagavathi(Lakshmi) on either sides of Sreerama inside sanctum sanctorum as per legend. 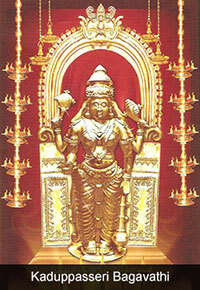 The Trippayar Thevar (Thevar is the Tamil version of Deva) is the presiding deity of " Arattupuzha Pooram". 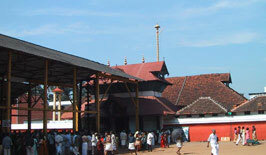 The temple is situated at Irinjalakuda 25Km south west from Vadakunnathan. The overjoyed "Baratha" eagerly waiting for the return of his beloved brother Sree Rama from exile is the pratishta sankalapa of this temple. The tantric practices, Rituals, methodology of offerings are distinct. Three Poojas Ethirettu Pooja Ucha Pooja, Athazha Pooja and no Siveli The floral offerings to the deity consist of Lotus, Tulasi and Chethi. No other flower is taken for Pooja or for making garlands and thetchi (ixora) and thulasi (ocimum sanctum) etc not grown in the compound. Incense sticks and camphor are not used for the pooja. There are no sub deities in this temple. The temple pond is also unique as but fish no other aquatic creatures are not available. The tallest flag post(kodimaram) in kerala and second biggest "Kootahbalam" belongs to koodalmanikyam. 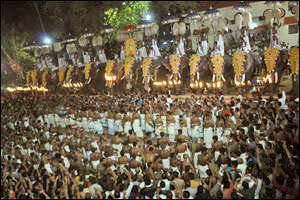 The 11 day long "Thiru ultsava" is the heavenly feast to art lovers of all branches. This temple dedicated to Sri Lakshmana is a rarest temple. 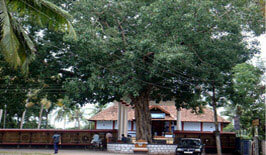 Situated near the mala-alwaye route, 30Km, away from Koodalmanikyam temple to words south - east direction. As per legend, pleased by the penance and meditation of Haritha maharshi Lord Mahavishnu gave some advices to the rishi. These advices considered to be "Thirumozhi" (sacred words) which named the place "thirumozhikalam". Kalam which means stage, turned to kulam and mozhi to moozhi in due course. Hence Thirumoozikulam. This a multi-shrine temple with Dakshinamoorthy, Sreerama, Sita, Vigneswara, Hanuman, Sastha, Bagavathy and Gosala Krishna. This temple is about seven kilometers away from Koodalmanikyam temple in the Irinjalakuda - Mathilakam route. Lord Satrugna is the embodiment of divine "Sreechakra" in the hands of "Mahavishnu". 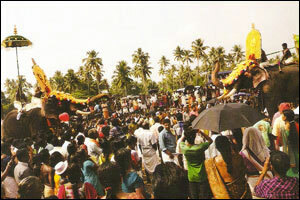 This is a unique festival of Thiruvanikavu temple in the picturesque village: "machadu" near Wadakkancheri in Thrissur. The principle deity is Bhadra Kali facing west. The importance is given to north nada where you can have the dharsan through a peep hole in the wall. Sub-deity is "Kshetrapalan". The rarest festival machadumamankam starts with "parapurappadu" on the first Friday of the Malayalam month "Kumbham" (Feb - march). The rituals and the methodology of the "parapurappadu" and "parayeduppu" are distinct. The ritual starts at night and receive offerings to an extent of 20 hrs continuously throughout the domain. And the relay continues for next 5 days. The oracle is carried on shoulders and the carrier is called "eduppanmar". The carriers are on shift but the oracle has to complete one round. On the fifth day - Tuesday - at noon the horses from 6 gramam's moves to the temple with panchavadhyam. The domains are thekkumkara, panamgattukara, punnaparambhu, karumathra, manalithara, viruppakka etc. The gigantic figurine of horses (kettukuthira-makeshift horse) are made on a wooden frame by cotton, hard board etc and tastefully decorated with ornaments and painted in pleasing colors. The procession will be followed by poothan, theyyam, kalavela and kumbhakudam. The devotees pays their salutation to the mother kali by throwing this makeshift horses to the air, higher and higher and rounding the temple. With thrilling fire works the "mamankam" conclude.